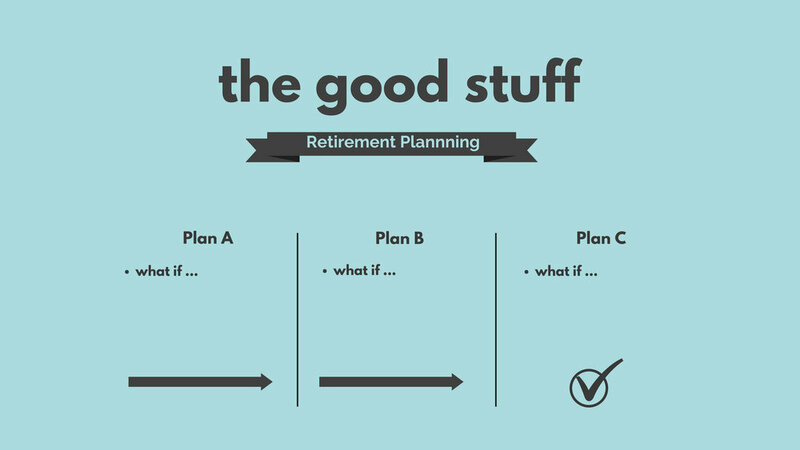 What are the first few thoughts that come to your mind about retirement planning? Take a moment, close your eyes and picture what you'd love to be doing most days in your seventieth year of life. If you're someone like me who LOVES what you do for money, you probably like the idea of continuing to work until you drop dead at age 90. For some, it's golfing and sleeping in most days. For others, at the top of the Good Stuff List there's a motorhome and one weekend per month with the grandkids. For everyone, the Good Stuff includes GOOD HEALTH. For those who love working at their job or business, the Good Stuff includes working and making money until the day they die. During my twenties, I was so confused about money. I learned who I am and what I want the way most young people do: looking around at the Good Stuff in other people's lives and trying to figure out how they earned the time and money to enjoy all that Good Stuff. My curiosity about business and investing landed me where I am today: in a career as a Financial Consultant helping families improve their finances and find fulfillment from their money. 1. 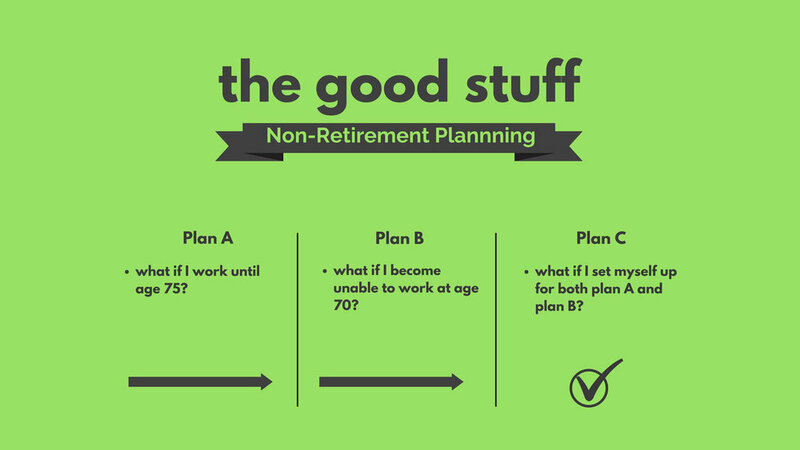 Retirement should NOT be Plan A. When working with my clients to create future options, we don't use the R-word. We build Financial Freedom Plans, usually three: Plan A, B and C.
The start of my career as a "financial advisor" (if you don't know why the title "financial advisor" is BS, read this article: www.the39forevermom.com/articles/banks) for a large international investment firm taught me how to get people to share their retirement dreams with me. The next step was helping them attach numbers to their Good Stuff. It was also my job to ensure everyone I spoke with understood how few people are saving enough for retirement, how rare pensions are and how many people end up working in retirement (like it's a bad thing?!). I met many people who were VERY FOCUSED on retiring - actually stopping work completely - at a specific age with a certain number of dollars invested. These people did not love their jobs. That's why retirement shouldn't be the goal. Retirement shouldn't be Plan A, because if you want to retire, that means you hate what you do for a living, and your focus should be on getting into a career that fulfills you FIRST and retirement SECOND. 2. Make a list of your Good Stuff, then schedule time to test out each activity/hobby - "mini-retirements" - NOW. What is it about your Good Stuff that appeals to you? Write the activities and lifestyle descriptions, map out a "Typical day in the life of 65 year old, super healthy me", then go live it for 3 or 4 days in a row the next chance you get. See how it feels. Are there things on your Good Stuff list that shouldn't be there? Or maybe you're so focused on saving for financial freedom that you have no hobbies or Good Stuff in your life right now, so you don't even know what you'd do if you didn't have to work!! Or maybe your Good Stuff is all about being busy volunteering and helping those in need. Or maybe you want to start a business. Write it all down. This is part of my financial consultation process, and I bet you won't find many other financial professionals who include this experiment in their process. (Find out more about how I help families at www.the39forevermom.com/consultation). "WHAT'S HOLDING ME BACK FROM HAVING MORE GOOD STUFF IN MY LIFE NOW?" Your golden years start when you say they do. This is your life, and you have to make it how you want it. Enjoy the Good Stuff every day starting today by making it a priority. Write down the things that are getting in the way of scheduling a three day "mini-retirement" in the next 3-6 months. Find ways to remove those blocks. PS, If you could use some Good Stuff ideas, listen to the song "The Good Stuff" by Kenny Chesney.